We’ve all been there. You’ve “it’s five-o’clocked somewhere” until the wee hours of the morning and now your head could use an inflatable raft. The morning after can be a struggle, but it doesn’t have to be! Was that exclamation point too loud? Sorry, we’re just excited sometimes. We’ve rounded up a list of healthy smoothies so you can spend less time scouring the iPad for recipes and more time with your shades on, hair-of-the-dog hangover cure in hand. These refreshing smoothies look like cocktails, but they’re packed with a punch of hangover fighters to get you back on your feet again and back to the beach where you belong. Already have seltzer, lime juice, salt, and mint on hand from yesterday’s margaritas? Then you’re on your way to smooth skies again with ingredients for this fresh watermelon cucumber smoothie. 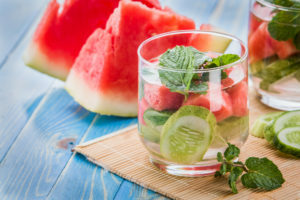 The watermelon is rich in electrolytes, which remedies dehydration, and potassium, which can soothe irritability, plus the mint settles stomachs – a perfect combo that will have you revitalized in no time! Make It: Combine the watermelon, cucumber, lime juice, salt, and mint in a blender and blend until smooth. Strain the mixture through a fine-mesh sieve, pressing to release all the liquid. Into a tall glass filled with ice, pour 1⁄2 cup (125ml) of the watermelon mixture and top with 1⁄2 cup (125ml) or more of the sparkling water. Stir in agave to taste, if using. It looks like a beach cocktail, but it’s so much more. Fresh pineapple for hydration and banana for a rich source of Vitamin C, with a touch of flaked coconut, these tropical flavors will leave no hangover behind. Not to mention, it’s vegan, dairy-free, and gluten-free, if that’s your style. This recipe is simple enough to make in less than three minutes, so toss this one in your Margaritaville Frozen Concoction Maker for a quick treat. Ingredients: 1 cup of almond milk 1 banana (fresh or frozen) 2 cups of frozen pineapple ¼ cup sweetened flaked coconut Make it: Place the almond milk, banana, pineapple and coconut in a blender; blend until completely smooth. Serve as is or garnish as follows. For optional garnishes, dip the rim of 2 glasses into water and then into a plate of coarse sugar. Pour the smoothie into the glasses and place a mint sprig into each glass. Place a wedge of pineapple and lime onto the rims of the cups. What’s better than fruity island aromas to relax you? 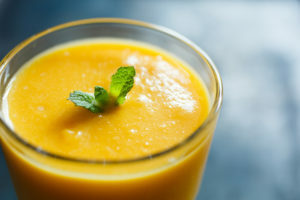 This tropical sunshine smoothie pairs Greek yogurt, rich in probiotics to balance your stomach, orange juice and mango, stocked with Vitamin C, for a taste of summer. Pour this one in a martini glass and drop a fancy straw in and you’ve got yourself an island-inspired cure. Ingredients: 2 cups frozen mango cubes 1 cup frozen pineapple chunks 1 ripe banana 1/4 cup orange juice 1 cup water 1/4 cup plain Greek yogurt 1/4 teaspoon coconut extract Make It: Add all the ingredients to your blender and blend until smooth. Add more orange juice and/or water if too thick to blend. Different blenders may require more or less liquid. Not everyone has to be a health nut to enjoy this green-as-the-sea hangover cure. Just blitz together a handful of fresh spinach (a natural electrolyte), a cup of your favorite frozen fruit, a banana, and coconut milk or water for hydration, and your body (and your liver) will be thanking you all the way back to the beach. We promise a little bit of green goes a long way! Ingredients: 1 ½ cups spinach 1 banana 1 cup frozen peaches, pineapple, or mango (your choice!) 1 cup coconut water A little bit of honey Make It: Combine all ingredients together in blender container and blend until smooth.